They’re each responsible for overseeing all customer jobs within a dedicated region. This approach builds our knowledge of every customer, their needs as well as their properties. It helps us deliver a better level of service. Whether it’s quoting for fixed price work, managing a job that escalates beyond the capabilities of a single tradesman, checking workmanship, or simply giving advice, your Service Support Manager can visit you whenever needed. We won’t ever charge for the time a Service Support Manager spends with you. Which region would you like more information on? We’re rolling out our regional support service gradually. 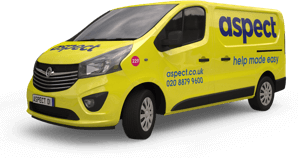 Our tradesmen and estimators can be booked for an appointment anywhere within the M25. Our team of office based account managers and field managers provide full customer support wherever you are in London.